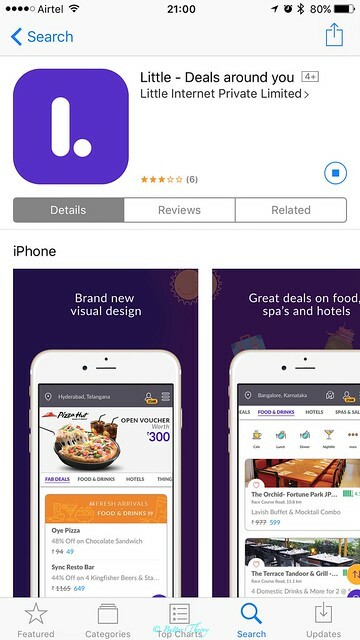 Little App is a deals discovery platform that offers a fantastic opportunity for customers to pick deals at their favorite establishments across services like hotels, adventure gaming, restaurants, spa etc. 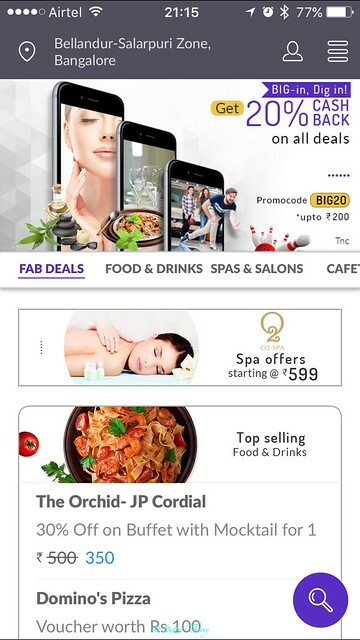 They proudly offer 50,000+ deals across 20,000+ merchants in all the major cities like Delhi, Bangalore, Pune, Kolkata, Mumbai, Hyderabad, Chennai etc. Who doesn’t like to get the same amazing experience at their favorite spa while saving a few bucks while doing so? It was a rhetorical question! 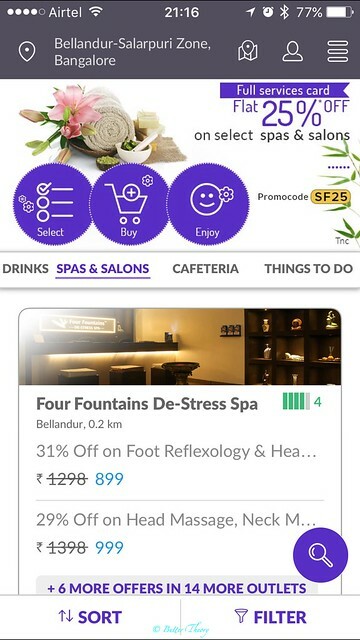 Not only does Little App provide deals for your nearest spa, but also to the best restaurants around you for a lavish buffet. After gorging on all that scrumptious food, it would be a crime to not burn those calories! So, how about let Little App help you with some gym deals? Sounds perfect, doesn’t it? Well, if you’re the kind who doesn’t like the idea of gym, they do have some amazing adventure activities like rock climbing, horse riding, go karting, scuba diving, river water rafting etc. If you’re bored with a 9-5 job every single day and then sleeping all day, all night during the weekends, then you might just be in luck 🙂 Little App has some of the best hotel deals you could ask for. So, go ahead and pack your bags for that exotic vacation in God’s own country; Kerala! “How do you get all these deals?”, you may ask. 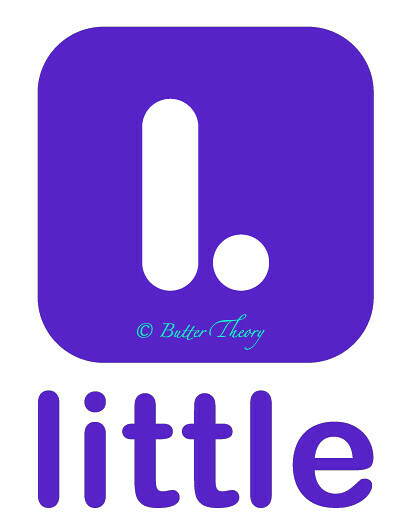 Simple – Just download the Little App on your smartphone and start grabbing some amazing deals! 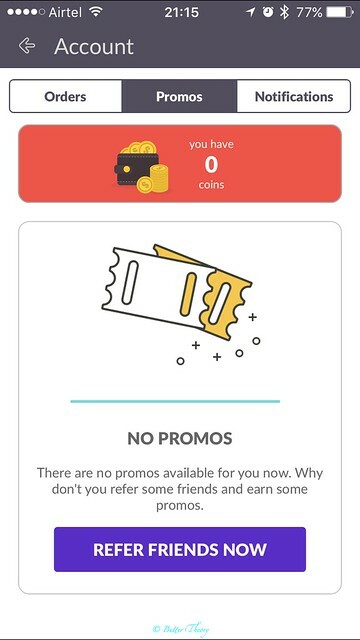 Well, what I’ll do is just show you how you’d go about using the app. This is on an Apple iOS device. Head to the App Store, and search for Little, the top most result will be the right app that says – ‘Little – deals around you’. 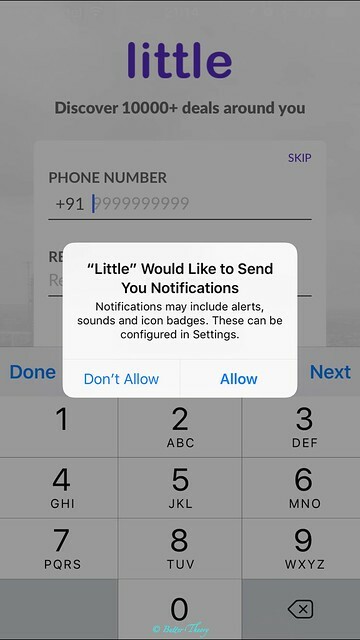 Fire up the app once it’s downloaded, it will ask you permission to send Notifications. Click ‘Allow’. 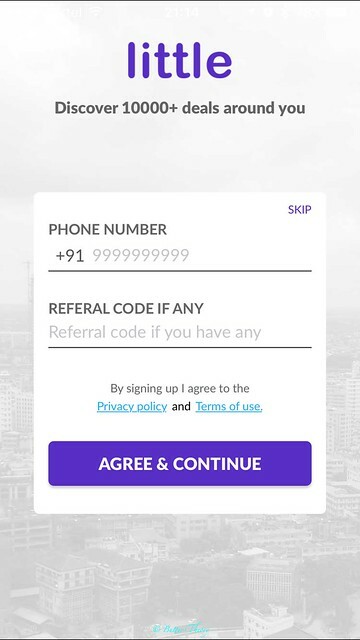 Then, you’d have to key in your Phone Number and click ‘Agree & continue’. 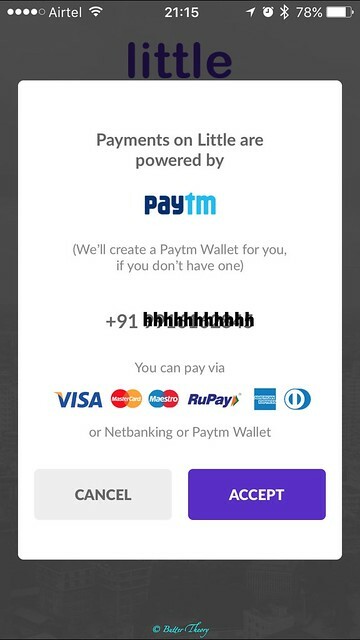 What Little does is, it links your App with your PayTm account, and the best part is that if you don’t have one, they’ll create one for you! 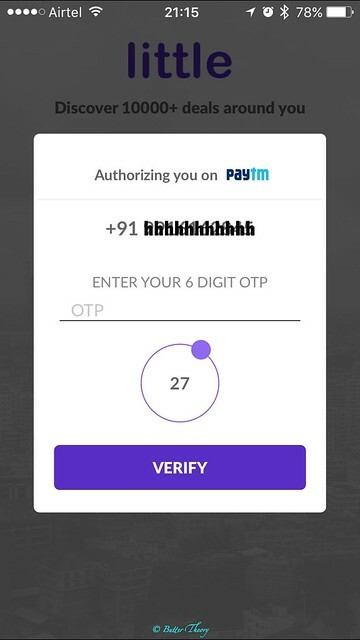 Once, you’ve safely authenticated your phone number and have your PayTm wallet linked, you’ll need to grant access to your location. 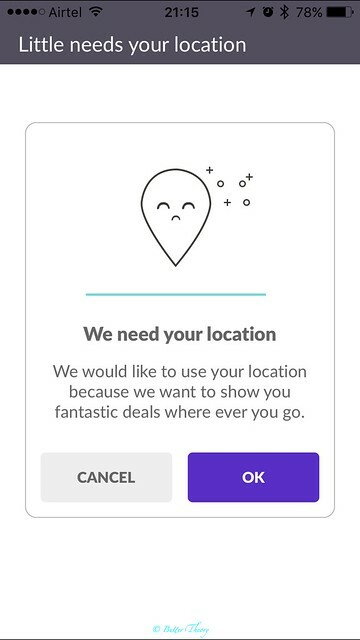 This is needed, so Little app can understand where you’re located and provide you the best deals sorted by distance from you! That’s a pretty nifty feature that’s available on most apps. So, don’t be shy and just grant that access 🙂 If you’re the kind who doesn’t want the likes of CIA, NSA and C-DOT(India’s surveillance org) knowing where you are, just don’t provide access and just be ready to manually enter location to look for deals! 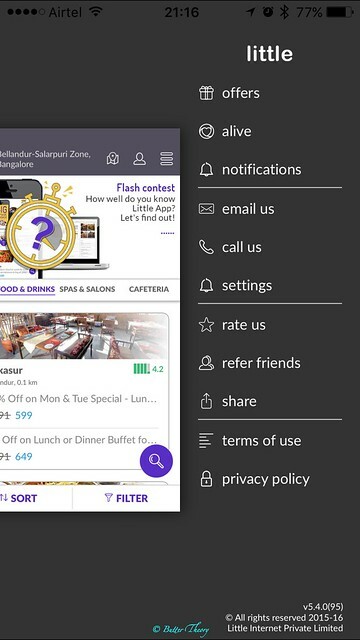 Take a look at the tabs ; Food & Drinks , Spa & Salons etc. It’s neatly organized into the several categories unlike other apps that have all the deals listed with no categorization whatsoever! 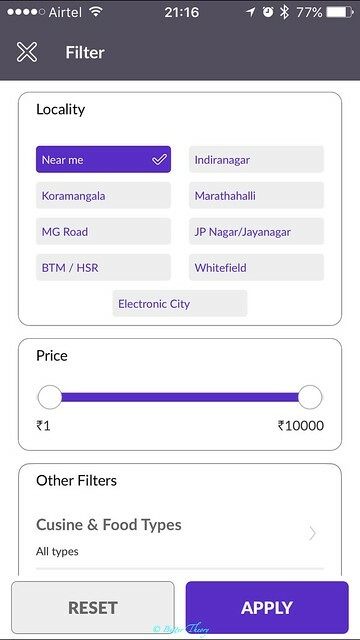 You could filter the deals by locality, price and a set of other useful filters! On top right, you could go into your profile and look at the Promos, Orders and Notifications. 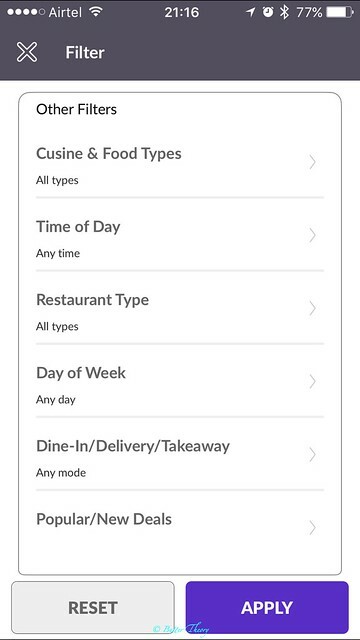 You could take a look at the menu of the app by clicking on the menu icon on the top right.